Twitter has partnered with Merkle to create tailored audiences and bring the power of CRM targeting to Twitter. Advertisers customer data segments are used to create tailored audience targeting segments in Twitter. - Twitter will not use this data in any other way. 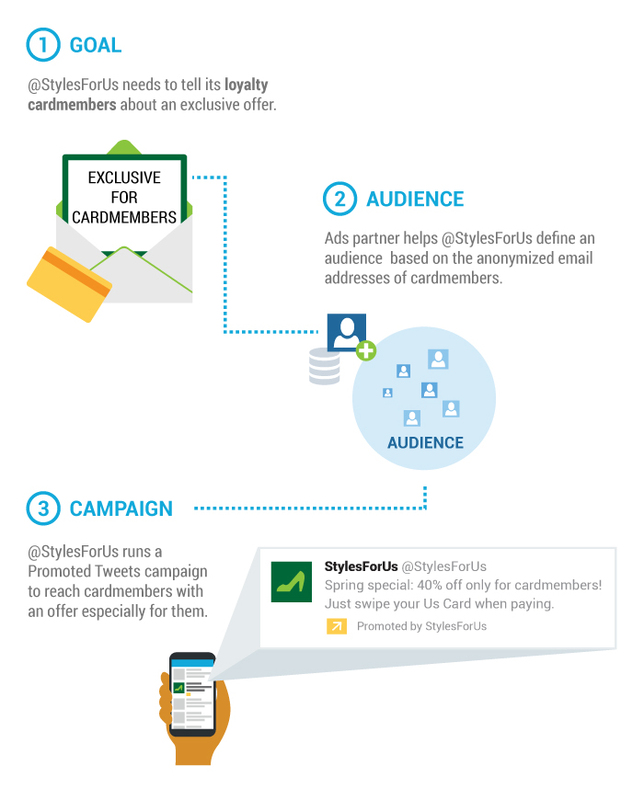 Once the audience segments are loaded into your Twitter Ads account, you can add them to (or exclude them from) your campaigns. In early testing with this product we've seen some great results: some advertisers saw an engagement rate lift as high as 170%, and some advertisers reduced their acquisition cost by as much as 73%. Brand and Direct Response advertisers and marketers can use CRM based tailored audiences to drive awareness, engagement, conversations, loyalty and conversions with existing customers and they can use CRM based tailored audiences to drive new customer acquisition by creating look-a-like audiences that most closely resemble current customer profiles while excluding existing customers. Work with Merkle to identify valuable CRM segments and enable your advertising teams to target them in Twitter. Give your agencies and marketers access to the segments they want to advertise to directly within Twitter to provide customized segment-based messaging. Ready to discuss the CRM approach for tailored audiences or need more info? Fill out the form below to be put in touch with one of our tailored audience teams who will help you get up and running. By checking this box, you are indicating that you do NOT wish to receive communications from Merkle containing industry trends and best practices, upcoming events, and corporate announcements.